Sitting right on the Wild Atlantic Way, the Aille River Hostel is the gateway to the majestic 700 ft Cliffs of Moher, the world famous Aran Islands and the unique beauty of the Burren landscape, home to thousands of rare wildflowers and archaeological Celtic sites. This 300 year old renovated cottage is situated on a quiet road at the bank of the Aille River, right in the centre of Doolin. This is a perfect spot for your stopover or extended stay in the area, where you will experience a warm friendly atmosphere in our old world surroundings. Visit the sights of Clare or just chill out by the river during the day..... then relax by the turf fire or check out the traditional music in the local pubs. Recommended by Lonely Planet travel guides as 'The best of the bunch' and Le Guide De Routard. Lets Go gives a 'Thumbs up'. Approved by Irish Tourism Board. Member of IHH holiday hostels group and Hostels of Europe. 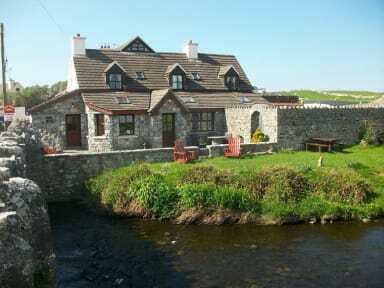 The Aille River Hostel in Doolin has a range of private rooms for couples, family rooms, and dorm rooms. Breakfast selection available for a small fee. We encourage traditional music sessions and many musicians stop over with us regularly. Live music can be heard or played in the local pubs McDermott's, McGann's and O'Connor's and Fitzpatrick's only 5 minutes walk away. Camping is also available with full use of hostel facilities with no lockouts or curfews. Hostel staff will be happy to inform you of local sights and activities including: The Aillwee Caves, Burren Heritage Centre, Cliffs of Moher, Doolin Cave, castles, forts, Celtic ruins, golf, hiking, Poulnabrone Dolmen, surfing, fishing spots, trips to the Aran Islands, as well as bus and travel information. So make Aille River Hostel your home for staying in the Doolin area. If you cannot find what you are looking for please contact us directly by email or phone. Love, love, love! Great staff, very clean. Breakfast for 1.50 well worth it. Close to beautiful walks. Locals very friendly. First hostel I actually slept for the full 7 hours. Lovely livingroom, sitting by the fire. Lockers in room. Cant say anything bad! Mijn verblijf in Aille River Hostel was fenomenaal! Ik nam onmiddellijk de boot naar Inisheer Island en de volgende dag the burren trail naar de Cliffs of Moher. Doolin is een geweldige plaats als je houdt van natuur! De hostel is gezellig en Heloïse en Kelly zijn supergastvrouwen! Verder gezellige sfeer en toen ik er verbleef geen gevoel van onveiligheid, alle mensen zorgen voor elkaar. Lekker gezellig boekje lezen 's avonds bij de stoof. 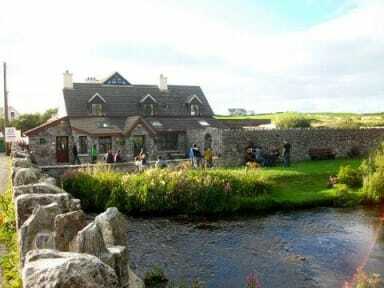 A lovely and beautiful hostel in the middle of Doolin. Close to the Cliffs of Moher and the Doolin Pier to catch a ferry to one of the smaller islands. Also some nice pubs in the area. All types of stays are available: mixed dorms, private rooms and even the possibility to camp outside. A large kitchen where you can prepare your own meals and a nice fire burning in the main room.